Salad includes: romaine lettuce, Tuscan kale, tomatoes, wild caught smoked salmon, olive oil, sea salt, pumpkin seeds, hemp seeds, lemon juice. Start by tenderizing the kale - cut into bite-sized pieces and drizzle with olive oil + lemon juice. Using your hands, massage the oil/lemon into the kale until it starts to wilt. Add freshly washed romaine lettuce to the bowl + tomatoes + pumpkin seeds + hemp seeds. Drizzle with additional oil, lemon juice, and a pinch of salt to taste. These flourless choc chip muffins are completely #vegan and #glutenfree and oh so tasty. Coconut oil adds some sweetness (without extra sugar added) and the almond meal is hearty and won’t leave you with a sugar crash. 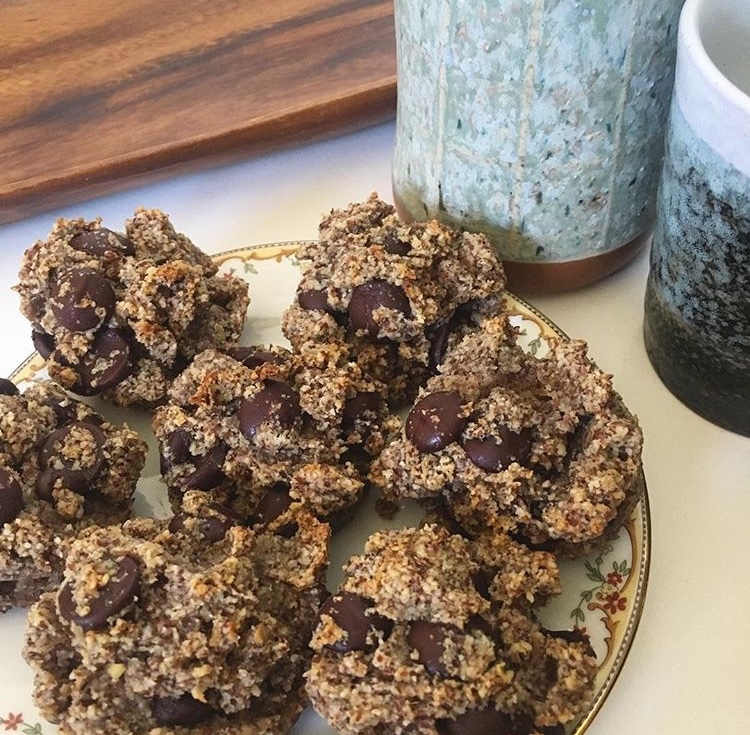 Recipe: combine almond meal (1 cup), ground flax meal (2 tbsp), salt (a pinch), baking soda (1/4 tsp), dark choc chips (your discretion!). Mix mix mix. In another bowl whisk together water (1/4 cup), pure maple syrup (2 tbsp), virgin coconut oil (2 tbsp), apple cider vinegar (2 tsp). Combine it all, scoop into muffin cups, and bake @ 325F for 20-22 minutes. Here's a simple recipe with immediate benefits. You can snack on these right after baking, or store for a few days and use as a salad topping. To make this dish well, it’s best to use fresh herbs, and a generous pour of salt, pepper, and dried herbs too. This can be a meditative exercise: try to stay present and acknowledge the space you’re in. Garbanzo beans are one of the most affordable ways you can prioritize your health today. They lower cholesterol and promote digestive health, as chickpeas are high in both soluble and insoluble fiber. With high levels of folate and magnesium, chickpeas are heart healthy. These beige little guys stabilize blog sugar and help to control weight as well. What’s not to love? Buy a few cans, keep them in a cupboard, and cut down on time at the grocery store. This is an example of one of my favorite ways of “cooking” or “preparing” food. It’s simply an exercise in assembling and arranging a bunch of beautiful colors that also turn out to provide a ton of nutrients and check all the right boxes for providing energy and nourishment. Healthy fats? Check. Essential vitamins? Check. Protein? Not a ton, but yes … check. Everything pictured here (minus that plate – a thrift store find, and that dreamy linen table cloth) is from a local farmer’s market. Living in California provides a lot of opportunity to get the freshest ingredients: picked the day before and then displayed on a table in the fresh air and sunshine the next day. I feel very lucky each week when I go to the farmer’s market. I certainly don’t take this direct exposure to farm fresh produce for granted. Lettuce wraps are a flavorful and easy summer lunch. It’s an opportunity to use seasonal produce and doesn’t require cooking or much time in the kitchen at all. Spread guacamole on the lettuce, layer with freshly sliced produce, top with some crunch and roll up. 1 Tbsp raw, local honey *See my note on honey below. Bring a pot of water to boil on the stove top. Add the lentils and cook for 20 minutes. Keep an eye on them and be careful not to overcook. Remove them from the stove right before they start to split open, so that they maintain firmness and are not mushy. At the same time, slice the jewel yams into matchstick slices. Chop half of the onion and sauté over medium heat for 10-15 minutes. Dressing: Finely chop the clove of garlic and combine it with the apple cider vinegar in a small bowl. Mix for a few seconds before adding the raw honey, Dijon mustard, and a bit of olive oil. The dressing should be the consistency of a vinaigrette. Wash the micro greens and arugula and set aside. Chop the celery into bite size pieces and roughly chop the pistachios. When the lentils are cooked, drain and pour into a mixing bowl. Add the yam/sweet potato and onion mixture. Add freshly cracked pepper and a bit of salt. Add the pistachio pieces and celery. Top with the dressing and mix well. Arrange the micro greens and arugula onto a plate and top with this lentil mixture. It’s best if served slightly warm, but also keeps well in the refrigerator for a couple of days if stored in an airtight container and makes for a quick and easy packed lunch. There’s really no point in consuming honey that’s not raw, local, and organic. Although the cute little bear containers are adorable, mass produced honey has been stripped of all nutrition and is basically just liquid sugar that happens to be the color of honey. It’s also usually a combination of honey from a couple of countries – Mexico, the U.S., and India seem to the ones I regularly see on honey labels in grocery stores – which is an odd visual to me. Picture those shipments of honey all combining into a big vat in some warehouse. A couple of years ago, a Food Safety News investigation found that 1/3 of the honey sold in the U.S. is imported from China. It’s the same honey that fails to pass safety standards in Europe and elsewhere as it may contain illegal antibiotics and heavy metals. Mass produced honey makes tracking food safety, the quality of the honey, and the working conditions for the workers in all of those countries VERY difficult to care about, let alone enforce. Buy from a local farm or beekeeper when you can! It makes life easier and is healthier for all involved – including you, the consumer and your local economy! What I like about this soup is that it feels like you’re doing something nice for your immune system. The turmeric, lemon juice and zest, ginger, red pepper flakes, and garlic are just a few key ingredients that make this soup put up a good fight against any of those cold and flu nasty’s that may be lurking in your system. Turnips and cauliflower are both nice sources of vitamin C and potassium, also helpful this time of year. Tip: It’s important to buy an organic lemon for this recipe. If you don’t use an organic lemon, you’re more likely to ingest chemicals from the rind given that most conventional citrus fruit is sprayed with a variety of pesticides. Generously add olive oil to a cast iron skillet or large pan. Separate the cauliflower florets and chop the turnips and onion. Add to the skillet and sauté for 15 minutes. When the vegetables start to soften, transfer them to a large soup pot coated with a bit of coconut or olive oil. Add freshly chopped garlic and the spices (red pepper, ginger, turmeric) and sauté for another 5 minutes to release the flavors. Add the vegetable soup stock and bring to a boil. Cover and reduce heat to low. Let simmer for 35 minutes. Ladle the vegetables and broth into a blender and mix until smooth. Be very careful not to make the same mistake I did – overfilling the blender to mix everything up faster is NOT a good idea and just results in a mess. Return the blended soup to the pot and spoon into serving dishes. Garnish with a fresh green like a sprig of parsley or rosemary.